After far too long, the starter valves are almost complete. Again, they are sold out, but I am making more waxes for another run later this year. These injectors are next on the chopping block! Test waxes are being sent out to a new foundry. I'm very pleased to announce that Eccentric Engineer has taken ownership of the tooling for Ed Yungling's 1.6" Westinghouse Cross Compound air compressors. I truly believe these are the finest compressors ever modeled for our hobby. They are extremely faithful to the prototype, and the molds were very masterfully made. I'm honored to have the opportunity to make them available to our hobby. If all goes well at the foundry with these few test waxes, you can expect to see castings for sale in a few months. Please click the links above for more information about a particular injector. Nathan 1921 Starter Valves in 1.6"
The starter valves are well underway! They are currently all spoken for, but another batch will come shortly alongside the Nathan 1918A non-lifting injectors. There are still a lot of parts to make and some testing to do, but please enjoy these photographs of the completed valves! 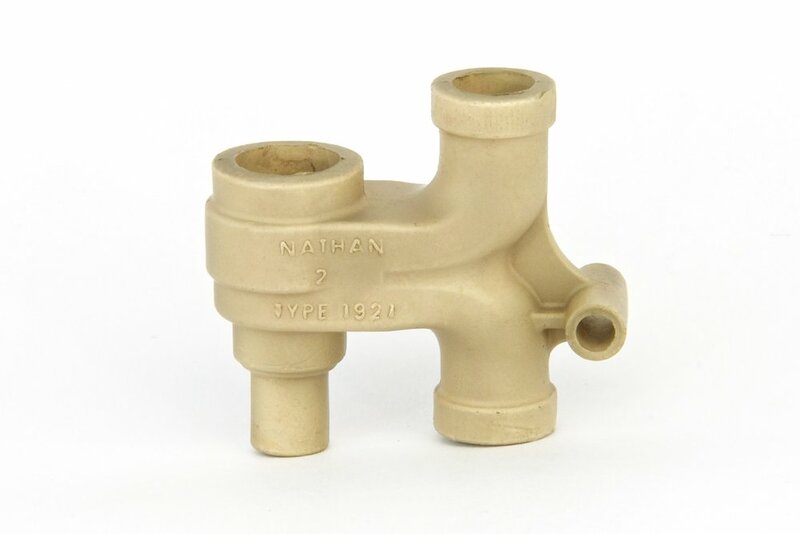 They were most commonly used with flanged pipe connections, but a limit number with spanner nuts will be offered. 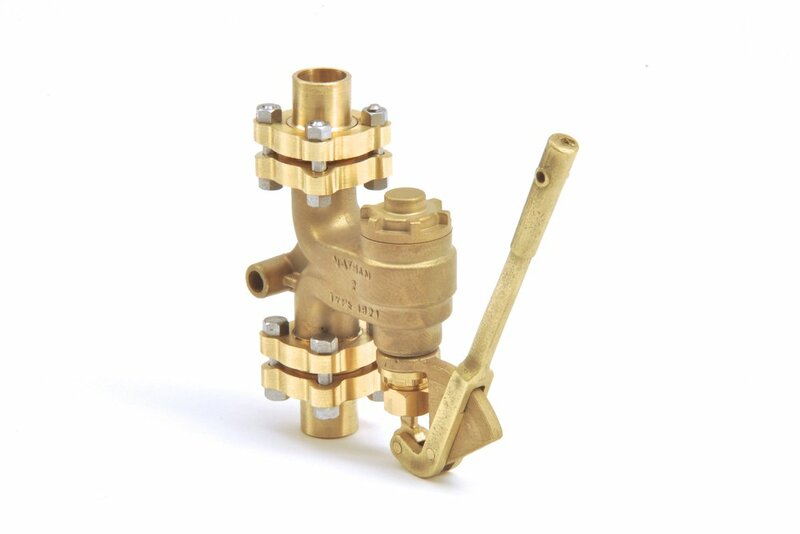 Let me know if you are interested in a starter valve, and I will start a list for the next batch of valves. The Small Scale Injectors are getting very close to completion. There have been a number of delays since my original date, but they will undoubtedly be completed this month. The final count for this first batch is 210 injectors, many of which are not yet spoken for. Spare parts will be available for sale as well. Standard Injectors will be back in stock shortly after the Small Scale Injectors are completed. Target delivery date is end of March. The starter valves will resume production after Standard Injectors are back in stock, and will be available in April. Fittings are IN STOCK! Click here to view and order. Unfortunately, porosity in the body castings has affected the entire second batch of injectors, and so delivery is delayed. New bodies are underway and injectors will be available before the end of August. The new bodies incorporate the boiler delivery into the body which eliminates the elbow from the design. This will make in-service maintenance much easier. A small run of injectors with the elbow will still be offered since the adjustable delivery angle can be essential in certain circumstances. Castings are here, and they look great! Machining on these will begin once injectors are finished. Many of the parts to be made from bar stock are already finished. Click the image below for more information! Components for these highly detailed injectors will be cast very soon. Still anticipating delivery of these injectors before the end of the year. I have decided to add reducing elbows to my line of fittings. These will be supplied in 5/16" to 1/4", and 1/4" to 3/16"
First batch of standard injectors is out the door! Thank you to all who ordered. Castings for the second batch will arrive tomorrow and have a target delivery date of 6-8 weeks. Wax patterns are done and headed to the foundry shortly! Production on these injectors is not too far off. A prototype 1918A has been built and will be at the LALS Spring Meet for viewing! 3/16", 1/4" and 5/16" waxes are in production and will be ready to ship to the foundry in the next week. Standard injectors are now shipping! If you expressed interest in an injector early on, I will be in contact with you to arrange payment and shipping. Castings for the second batch should arrive any day, and machined components are already in production. Thank you everyone for your support! The first batch of Standard Injector is in production, however it is ALREADY spoken for! Castings for the second batch have already been ordered and completition is anticipated mid-year. Make sure to get your name in on the list for next batch! Send your contact information and how many injectors you need. No deposit required.